When it comes to teaching children, I've found the best way to do so is by coming at it with something that interests them. After all, if your kid hates sports, where is the motivation for them to read a book about them? From numbers, shapes, colors, reading...using something your child loves as a tool can be a great thing. So, why should teaching your child about the Bible be any different? Why not take a character and story they love and use it as a learning tool? For many boy (girls too) like my son, superheroes are the best, and of all the superheroes, Spiderman is one of the coolest. While the movie itself may not be a religious movie, it certainly has many great themes and lessons to be learned. The electronic discussion guide uses corresponding bible verses to take a look at some of these themes and open the discussion with your child. It takes those characters and story lines your child already loves, and uses it to teach them biblical lessons. Now think about this- as a child which would you have preferred- discussing a movie/character or the Bible? As an adult, I now know that there are many intriguing stories inside, but as a child it just seemed boring. This guide is a great way to introduce it to kids who might otherwise lack interest as well. For kids like my son with a less than amazing attention span, the guide is only 5-pages long. There is plenty of great information loaded into those pages, but not so much that they'll get bored with it either! Overall, I loved the discussion guide and look forward to sharing with my son. This is truly a great resource for parents of super hero loving kiddos. Do you have a Spider Man fan in your life? You're in luck! 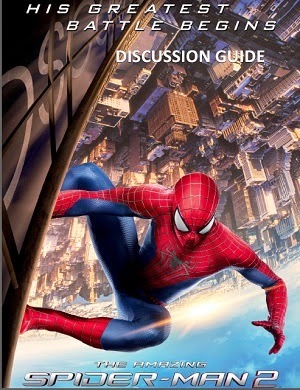 To celebrate the new movie and discussion guide, one winner will have the chance to win an awesome Spiderman prize package including a t-shirt, paper mask and phone case! Enter using the Rafflecopter form below. My husband is the #1 fan and he gets our 3 boys Spiderman shirts and jammies...and anything else he can find...so they are fans too. My boyfriend and our son are both fans. I think my son is moreso. My grandson. I didnt realize how big of a fan until Christmas, thats all he wanted was a Spidey glove. my niece and little brother love spiderman! !